Tired of the same old Aesop? Here's a new twist on the classroom favorites. Aesop's Opposites combines the age-old teachings with the concept of opposites. And to add to this double dose of fun are the instructions for some wacky classroom participation. Be a Houdini in your classroom! Mesmerize your students with science experiments that appear like magic from the content of original stories, folktales and poems. Fun, as well as educational, these stories include: How Cats Got Their Purr, The Ambitious Raisins and The Famous Feud of Mason Jar Gulch. Each storytime experiment includes a complete list of materials, easy-to-follow directions, a detailed explanation of what science concept(s) the experiment demonstrates and optional presentation ideas. The companion script includes directions for smoothly incorporating the experiment into the story. With these storytime discoveries, your students will enjoy learning science as much as you'll enjoy teaching it in this creative way! Science and storytelling are a class combination that mix well. As students become engrossed in this collection of original stories, folktalkes and poems, they'll become equally absorbed in the accompanying earth science lessons. Treat them to exciting and educational storytimes with fun tales like Pecos Bill, Tyler and the Time Machine and The King's Trick. Each interactive storytime includes a complete list of materials, easy-to-follow directions and further discussion of the science concept. So go ahead and experiment with these great tales. You're sure to enjoy the results. This collection of original stories, folktales and poems are bound to boggle the mind, tickle the funny bone and please the participants. A delightful blend of biological science and storytelling...from head to foot. 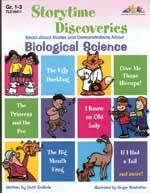 Fun and informative, this collection includes: That’s Impossible, King Midas and If I Had a Tail. Each storytime includes a complete list of materials, easy-to-follow directions and further discussion of the science concept. As unique as a thumbprint, these stories will give students insight into the biological structure of life around them, making storytime both educational and fun. Math should be fun and the stories and activities in this book will guarantee it! Through interesting folktales, poems and original stories students learn about logical thinking, problem solving and various mathematical concepts such as: measurement, shapes, telling time, addition, fractions, map reading and much more. The creative ideas end with a page of ridiculous arithmetic riddles which students will love. Everything in this book is so much fun, you may have to remind your students that they're learning about math when they're listening to the stories and completing the activity sheets! Reproducible activity sheets are provided as well as an answer key at the back of the book. 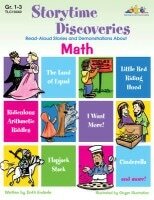 No matter how you add it, Storytime Discoveries: Math will multiply the number of smiles in the classroom, and that equals a room full of fun. 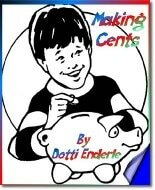 Making Cents (an e-book that counts!) is a fun and educational picture book for preschool children. It not only entertains, but teaches children the values of money as well. ​Download Making Cents for free! I've written lots of actvities for Gryphon House's Giant Encyclopedias. Here are two samples ... Pencil Pals and Riddle Rhymes.